John Wenck’s practiced stroke lifts his paddle quietly from the water. When he’s kayaking, he finds pockets of calmness and quiet, even when surrounded by a bustling city. Photographer: Duane Tinkey. Greater Des Moines rivers and creeks seem to saturate the news these days—as the villain in accounts of flooding and the victim in opinion pieces decrying water quality. But in another storyline, these waterways play the part of hero, rescuing weary city dwellers who seek both solitude and adventure. An image is etched in the mind of John Wenck from his first time kayaking on the Des Moines River: Over one shoulder, a bridge spanning the river with cars buzzing overhead. Over the other, a bald eagle perched in a dead cottonwood tree. But for many residents, there’s no need to wait for a plan. They’re playing in, on and along the rivers and creeks now. Here are stories from five of them—a paddler, stand-up paddle-boarder, birder and walker and an angler—along with their advice for how you, too, can get in on the action. Following his first experience of kayaking on the Des Moines River, John Wenck became an enthusiastic advocate, serving four years as president of Central Iowa Paddlers. 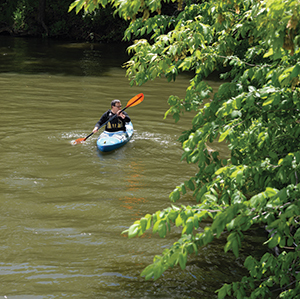 After months of hounding, a friend finally persuaded John Wenck of Des Moines to try kayaking on the Des Moines River. The next hour on the water would literally change the course of Wenck’s life and career. Sitting low in the kayak, very close to the water, he started to feel an intimacy with the river, a calmness that could be found in a pocket of quiet surrounded by a bustling city. That was 2004. Within a month, he and his wife had invested in their own equipment. He went on to join advocacy groups, spending four years as president of Central Iowa Paddlers. Today, at 50, Wenck is the water trails coordinator for the Iowa Department of Natural Resources, where he works daily to introduce Iowans to paddling. Resources: Wenck recommends the activities calendar on Central Iowa Paddlers’s website at centraliowapaddlers.org for people who have equipment and want to connect with other paddling enthusiasts. 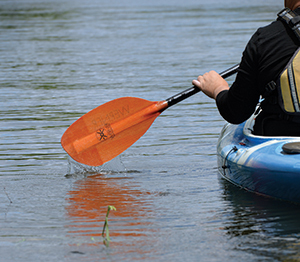 For people without gear, Wenck suggests booking an outing with Argo Adventures, an outfitter offering canoe and kayak rental as well as shuttle service. Trips are along the Raccoon River, starting at the canoe ramp in Walnut Woods Park and ending at the canoe ramp in Water Works Park. For more information, visit goargoadventures.com. Just out of eyeshot from the Interstate Highway 35 bridge over the Raccoon River in West Des Moines is a quiet place in nature where you can surf on the river. Ever since their children were old enough to swim, Katie and Bryce Gilbert of Warren County have been bringing them here to play on the water on stand-up paddle boards. They paddle upstream to Commerce Ledges, which consists of three natural ledges in the riverbed. The water rushing over the ledges creates a wave. “River water is washing past you,” Katie explains. “But you’re surfing, pointing upstream. You’re standing still, and the water is rushing past you. You get a little adrenaline rush. It’s just fun—there’s nothing like surfing, when you feel that water take off under the board. Resources: Check out Katie Gilbert’s No Coast Stand Up (nocoaststandup.com), which she started to spread the word about stand-up paddleboarding in Iowa. She offers introductory classes on local lakes and helps organize Ladies’ Night and Men’s Night. There’s also a Facebook group called “Des Moines Stand Up Paddle Group,” where you can find out about upcoming events and connect with paddler boarders. 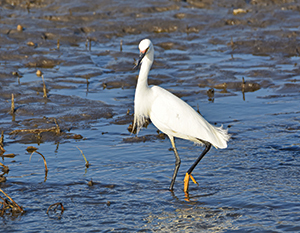 Snowy egrets are a rare and exciting find for birders like Des Moines-based photographer Whitney Rounds, who says they turn up along the Des Moines and Raccoon rivers now and then on their migratory travels. Photographer: Whitney Rounds. Unless you’re in Florida, it’s unlikely you’ll encounter a roseate spoonbill, a large wading bird with pink feathers and a flat, gray bill. But there it was—in Iowa. Bissell has been fascinated with birds since he was a boy watching his grandmother’s birdfeeder, and today he is a dedicated birder who loves spotting rare specimens. He keeps lists of the birds he sees and participates in friendly competition with other birders on who can spot the most species in a year. He even acts as one of Iowa’s reviewers for claims of rare bird sightings on an online birding database. At least five days a week, often on his lunch break, Bissell takes leave of his desk at EMC Insurance in downtown Des Moines and sets out to one of the many bird habitats in the metro area. Either on foot or in a car, he wanders through Water Works Park or Gray’s Lake Park and looks for birds. Resources: Bissell says Greater Des Moines is rich with bird habitats, given the presence of two rivers, which act as migratory corridors. Water Works Park and Gray’s Lake Park are two easily accessible birding locations close to downtown. Each spring, the Des Moines Parks and Recreation Department (dmparks.org) offers introductory birding classes; Bissell is the teacher. He also recommends two websites for birders of all levels of experience: iowabirds.org and ebird.org. For Des Moines angler JJ Bailey, the pursuit of fish is as much the sport as the catch. One trip stands out in his mind. It was a hot summer day last year, the ground was already wet, and another storm was rolling in. Bailey, 41, set out on foot to one of his personal, I’m-not-telling-you-where-it-is fishing holes on the Raccoon River: “We’ll just say somewhere west of 63rd Street.” It’s a half-mile walk to his spot, so he had to pack in his two rods and reels, a live bait bucket, a backpack of fishing supplies—some 50 pounds of gear. He wore a full rain suit, not so much to stay dry—it’s basically a wearable, sweat-inducing sauna—as to fend off swarms of mosquitos. The water is ankle-deep. “And I’m just hoping I don’t get hit by this storm, hoping this is going to be worth it,” he says. It was. Just as the black wall of the storm was about to reach him, he landed his biggest fish yet, a 35-pound, 42-inch flathead catfish, what he calls the apex of predator fish species in Central Iowa. Resources: For newcomers to the sport, Bailey recommends starting on calm waters where they can focus on honing their skills, then graduating to fishing on the river. He suggests the Iowa Department of Natural Resources as a good online resource for information, events and classes (iowadnr.gov/fishing). For gear, he likes Casey’s Bait and Tackle in Des Moines, Johnston Bait and Tackle in Johnston, Bass Pro Shop in Altoona, and Sheels in West Des Moines. 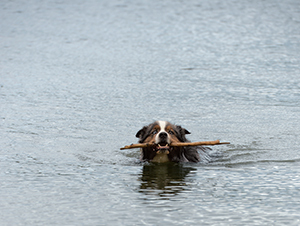 Dash, the bright-eyed and eager companion of Melanie Sadeghpour, sees a stick as a good reason to splash wildly into the river. But Dash isn’t always sold on the importance of hauling the stick back out. Photographer: Duane Tinkey. In a world awash in programmed activities, games with predefined rules, and constant demands on time, it’s easy to skimp on the simple pleasure of going outside to play. Not so for Melanie Sadeghpour of Des Moines. She grew up playing in, on and around the lakes of Minnesota. Today, at 42, she is the mother of an inquisitive toddler and energetic Australian shepherd, and she and her husband, Cameron, make a point of taking them to one of the metro’s parks with access to creeks and rivers every weekend for daughter, Ada, and daily for the dog, Dash. Gunnar Olson is a freelance journalist with an interest in the inner workings of cities and their residents. 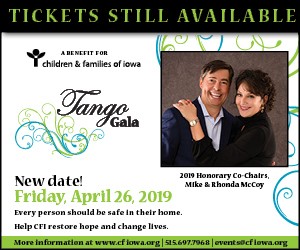 He is the communications manager of Des Moines Area Metropolitan Planning Organization and a former staff writer at The Des Moines Register. He and his wife, Sara, live in Windsor Heights with their children, Ellis and Louisa.